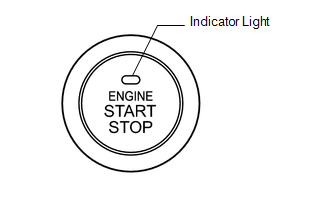 (a) Check the function of the engine switch. (1) Check that power source mode changes in accordance with the conditions of the shift position and brake pedal. (b) Check that the power source mode changes without pressing the engine switch. (1) With power source mode on (ACC) and the shift lever in P, wait for at least 1 hour. Check that the power source mode changes from on (ACC) to off automatically. (a) Check the indicator light on the engine switch. (1) Check that the engine switch indicator turns on and changes color according to the table below.